I have always revered the heritage and romance of lambic brewing. From old-world unmalted grain and complex turbid mashing to spontaneous fermentation and precise blending, lambic truly embodies the unity of science and art. And it’s those magical wild microbes that take residence in the beer for upwards of three years that remind us that the best beers require patience. The best beers take time. I attempted my first spontaneously fermented lambic in 2015 with the intent to rebrew it each year thereafter. For this year’s version, I tried to replicate the traditional lambic turbid mash after reading Levi Funk’s converted recipe (based on Mike Sharp’s description of the Cantillon turbid mash). For those unfamiliar with a turbid mash, the main goal to is create a starchy, dextrinous wort to feed wild microbes during the long lambic fermentation (typically one to three years). 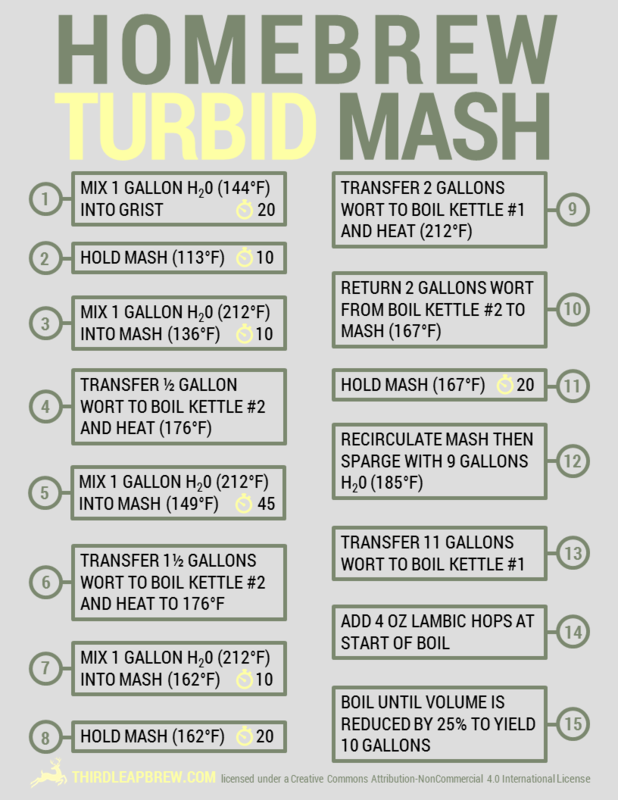 Similar to a decoction mash, a turbid mash is a step mash process. In general, it consists of a beta-glucan rest, protein rest, saccharification rest, and mash-out. The beta-glucan rest (113°F) improves the clarity and viscosity of the wort. The protein rest (136°F) improves stability, body, and foam retention. The first saccharification rest (149°F) favors beta-amylase activity while the second rest (162°F) favors alpha-amylase activity. Execution in this order maximizes wort fermentability. The mash-out (167°F) halts further saccharification, essentially “locking in” the total sugar composition of the wort. But what about the dextrinous component? 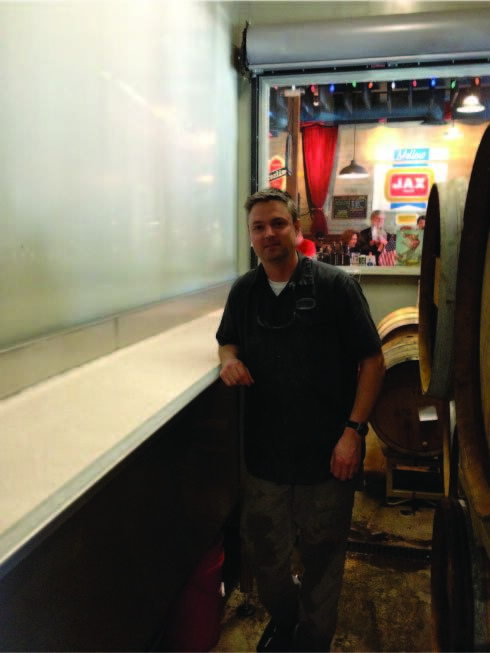 That is addressed through two separate wort run-offs, which are subsequently heated to near-boiling temperatures. Since this was very confusing to me at first, I relied heavily on TheMadFermentationist’s pictorial turbid mash. Hopefully the flow chart I created (click to view larger image), coupled with the pictorial and text descriptions, will a make the turbid mash process easier to understand and follow. Unfortunately (but as anticipated) I missed several target temperatures throughout the turbid mash, which caused delay in the brewday. After step #5, mash tempature was only at 124°F. I added a few gallons of boiling water to reach the correct saccharification temperature. Similarly, after step #7, mash temperature was only at 152°F. I opted not to correct this one because I was concerned about diluting the mash even further. Despite these deviations, the preboil SG was spot on. 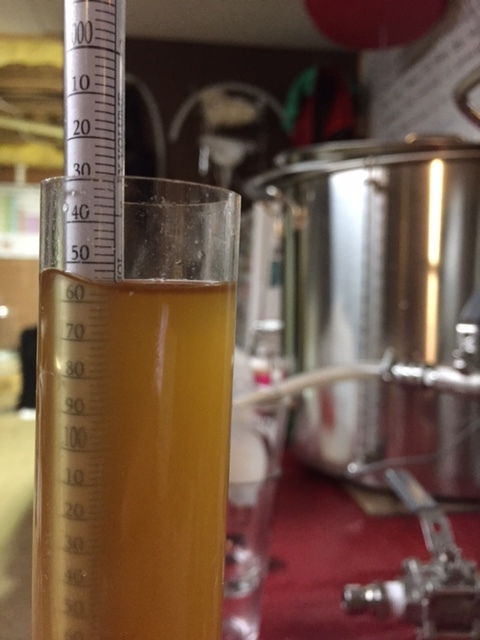 Unfortunately, I lost track of time during the long boil, and the wort was reduced by 36% instead of 25% volume, resulting in an 1.059 OG and just 8 gallons (4 gravity points higher and 2 gallons less than anticipated). The completion of the boil marked the end of my adherence to the traditional lambic turbid mash process. Before Russian River added a coolship, they utilized a rinsed (but not cleaned/sanitized) mash tun to hold and innoculate their cooled sterile wort overnight (this was the method used for my first lambic attempt). For this recipe iteration, I spliced the old Russian River method with the traditional lambic method; running boiling hot wort into a rinsed MLT left to cool outdoors overnight. Fortunately, we had a few bracing-cold April nights, so I was able to capitalize on one of the last sub-33°F nights. Only time will tell if the extra effort will make any meaningful difference. Notes: Brewed solo on 4/9/2016. pH readings were 5.92/6.19/6.6/6.25/5.76 (mash/2nd run/3rd run/preboil/postboil). Rinsed, but did not clean nor sanitize MLT. Ran boiling hot wort directly into MLT and placed outside on cloudy night at 9PM (37°F) with a sanitized cheese cloth covering the top. At 7AM (27°F) the next morning, MLT was retrieved from outside. Cheese cloth had fallen into wort. Did not homogenize wort. Ran 2.5 gallons into small Better Bottle and the remainder (5 gallons) into large Better Bottle. Wort was approximately 70°F. Let temperature drop to ambient (66°F) before pitching house bugs into the 2.5 gallon portion. Did not pitch anything into 6.5 gallon portion. Krausen and activity visible for 6.5 gallon portion on 4/14 and 4/15, respectively. And for the 2.5 gallon, they were visible on 4/17 and 4/20, respectively.